Did you know macadamia nuts are not a healthy snack for your dog? Longwood Veterinary Center’s patient, “Henry”, was recently seen for the ingestion trifecta: chocolate covered macadamia nuts and potentially raisins! According to his owner, Henry was fine the night he ate the nuts. In the morning he was obviously not well. Henry was extremely reluctant to come downstairs and, when he finally did, he collapsed on the last step. Henry was ataxic, meaning off balance, on both hind limbs. Thankfully his parents knew what to do. 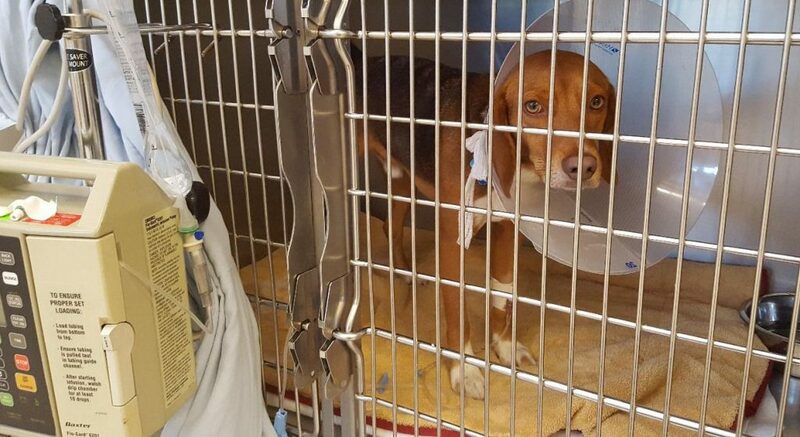 They immediately called The Pet Poison Helpline and followed their recommendation to bring “Henry” to Longwood Veterinary Center for hospitalization. “Henry” was placed on intravenous fluids, administered through a catheter in a vein in his front leg. We ran in-house bloodwork several times while he stayed with us to monitor his liver and kidney function. His neurologic signs and coordination improved the following day. IV fluid administration continued for another 2 days to flush the potential toxin out of his kidneys. “Henry” went home on the third day and made a full recovery. Ingestion of macadamia nuts by dogs has been associated with a non-fatal syndrome characterized by vomiting, ataxia or weakness, fever, muscle tremors and depression. The mechanism of toxicity is not known, meaning we are not 100% sure why dogs are affected, but dogs are the only species in which signs have been reported. Dogs need to ingest more than 2g of nuts per kilogram body weight before signs are shown, and “Henry” definitely had his fill. Diagnosis is usually based on the history of exposure (normally within 12 hours of ingestion), along with clinical signs. Macadamia nuts may also be identified in the vomitus or feces. In addition, there may be a mild increase in liver enzymes, but these values quickly return to normal. There is no specific antidote available for this toxin. Fortunately, most dogs will recover with supportive treatment and nursing care which includes intravenous fluids, pain relief and fever reducing medications. We are thankful “Henry” was brought to us for care as soon as he showed signs of illness. His relatively uncomplicated recovery was due, in large part, to the level of attentiveness and concern shown by his owners.